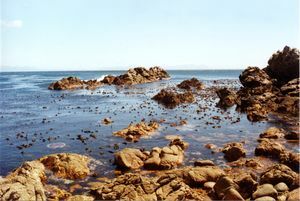 The dive site Ankers is a shoreline rocky reef in the Rooi-els area on the east side of False Bay, near Cape Town in the Western Cape province of South Africa. Ankers is partly sheltered from south westerly swell, and the entry area is more sheltered. The site may be diveable when access to other sites nearby is marginal. Named "Ankers" after the original house which stood on the rise above the cove, which was demolished and rebuilt in 2003. Maximum depth of about 20m is out beyond the point. Medium profile sandstone reef. Mostly bedrock outcrops, with some large boulders, small overhangs etc. Rocky bottom ends at 20m at sand bottom beyond the point. The photograph shows the big island rock. Around the corner to the right is Balcony dive site. The gap to the east of the big rock is quite shallow (about 4m). There are several big ridges to seaward of this rock. 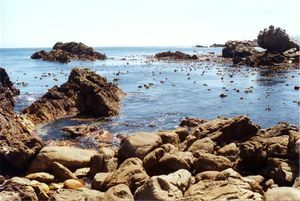 Geology: Ordovician sandstone of the Table Mountain group, probably Peninsula formation. Strike north-west, dip fairly steep north east. Fairly sheltered, Does not get south east swell, so often at its best during or after south easterly winds (offshore). Long period south west swell will refract into the cove and it is directly exposed to north westerly wind and waves. None. Park at the side of the road. Security is probably better than most roadside parking, but lock your vehicle as there are troops of baboons which may vandalise in their search for food. 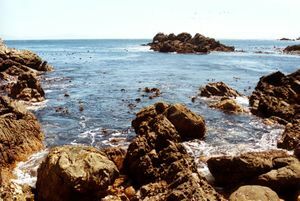 Drive to Gordon’s Bay and continue on the R44 to Rooi-Els. Turn right into Porter street. (2nd right after the bridge over the river). The road runs along the foot of the mountain, and soon turns sharply to the right and goes downhill for a while. Drive along this road until the last turnoff to the right (Oceanview street). The road that goes further slightly to the left is a cul-de-sac. Turn into Oceanview street. Keep left into Perspicua street and drive with the sea on your left until the road curves to the right and goes uphill slightly. Park where you can without obstructing the road. Start of path at side of road. There is a good path which starts at the side of the road at S34°18.541’ E018°48.872’ and follows the wood fence around to the bay. There are two entry areas, both moderately protected and fairly obvious. View along the south shore of Ankers toward the point. 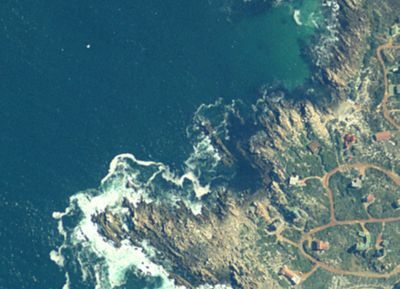 Entry is possible at a number of points in the left foreground, where it is quite shallow. The small gully in the left foreground is on the South shore, and is easily seen from the path. This is a fairly good site for macro photography. 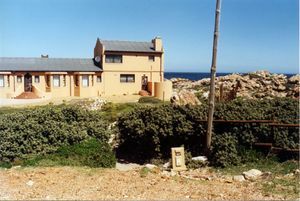 North west along the reef parallel to coastline: Swim with the reef to your left as far as the point, then follow a compass course about 300° magnetic to about 18m depth, Return a reciprocal course. 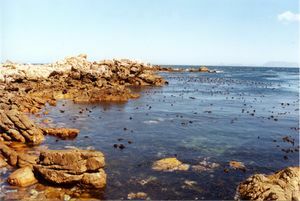 North round rocky islet: Through the gap to the east of the rocky islet, round the back and back south to the west of the islet. Entry and exit can be tricky in a swell. Surge around the rocky islet can be very strong. No special skills required. This site is suitable for night dives, novices and snorkellers. No special equipment required, but there are crevices and overhangs which are best investigated with a light. This page was last edited on 10 March 2012, at 22:28.